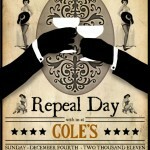 Cole’s Red Car Bar is celebrating its 103rd Anniversary and hosting a Repeal Day celebration on Sunday, December 4th. 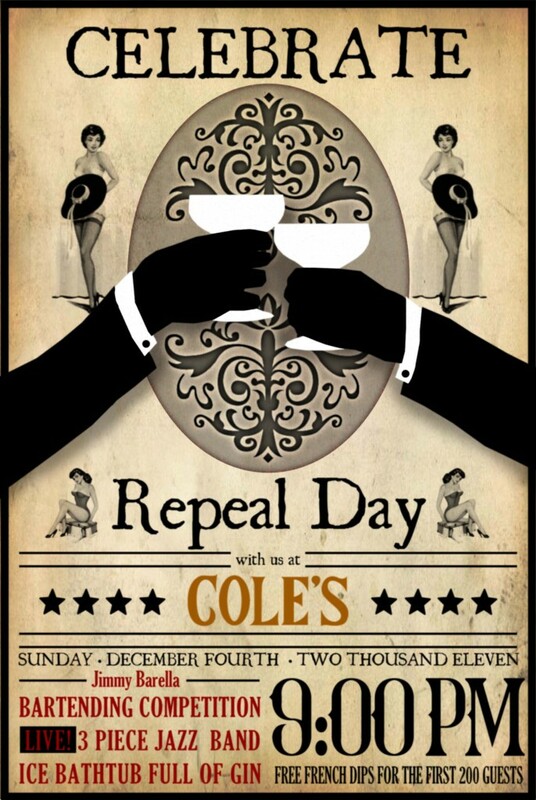 Created in 2006 by Jeffrey Morgenthaler, Repeal Day is celebrated by imbibers around the country to honor the repeal of the Eighteenth Amendment and the end of thirteen years of Prohibition. Free French Dips: get 'em while you can. 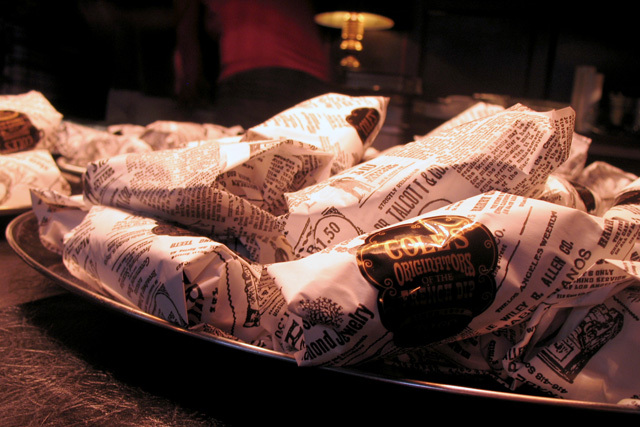 Free French Dip sandwiches for the first 200 guests in honor of Cole’s anniversary. Free Bathtub Gin Punch by Plymouth Gin, served from a bathtub ice sculpture from 9pm to midnight (or until it runs out). Midnight champagne toast to start Repeal Day. 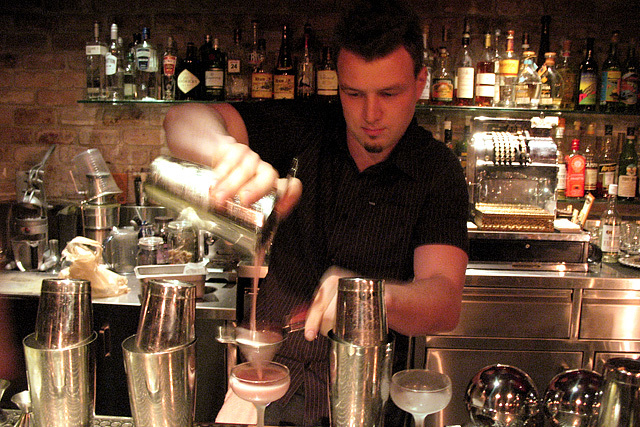 2010 Jimmy Barela Award winner Oliver Jones makes his Myrtle Berry Flip. Before the stroke of midnight, two of LA’s top bartenders will go head-to-head and vie for the Jimmy Barela Award, which honors the legendary bartender who held court at the Red Car Bar for 65 years, from 1918 to 1983. In 2009, the inaugural award went to Julian Cox (for his G.T. Foam Home) and last year’s winner was Oliver Jones with his Myrtle Berry Flip. Both barmen had their winning cocktails featured on the Red Car bar menu. This year’s finalists will be selected from a pool of eight bartenders competing earlier on Sunday at The Varnish, in an invitation-only tournament hosted by Eric Alperin and judged by industry peers. The 2011 Jimmy Barela Award winner will be announced at midnight, and the victor will have the honor of pouring the champagne down the pyramid of glasses set up for the occasion. For more Repeal Day specials and recipes, be sure to check out Caroline on Crack’s LA Weekly round up.